There are few things in this world cuter than a puppy ­– or a ferret or a kitten. Carley Self and Chris Sercovich so much in this concept, that they decided to get married surrounded by all of the adoptable pets at the Louisiana SPCA. With their furry attendants in tow, Sercovich and Self said “I Do” on June 21 in the facility’s Ochsner Courtyard. “Our goals were to get married and raise some money for the SPCA,” says Self, who with Sercovich is an LSPCA foster parent. The couple enlisted the help of Matthew Foster Photography to capture the day that included cake and “pupalato” from Sucre. The bride’s purple dress is from Italy Direct Clothing in the French Quarter. Her hair was done by Felicia Cary at Headcase in Algiers Point and makeup was by Krystal Lambert with Krystal Clear Esthetics. 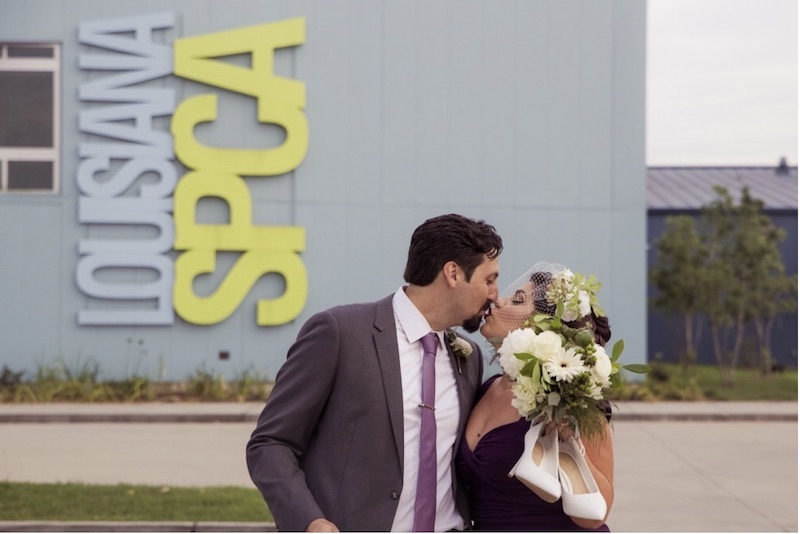 Chris and Carley still encourage people to donate to the SPCA through their wedding website here.